We are all familiar with the legendary ethics lesson of George Washington’s honest confession that he couldn’t tell a lie about chopping down his family’s cherry tree. God knows we all, yours truly included, need to learn and relearn that basic ethical lesson these days. We all know honesty is sorely lacking by commission and omission from government offices to corporate board rooms to college athletics departments to ecclesiastical authorities to intimate family relationships. I don’t mean to take any of that lightly, but I had a humorous insight into George Washington’s cherry tree incident today that I want to share. I imagine that many of you, like me, can use a little levity in these turbulent times. 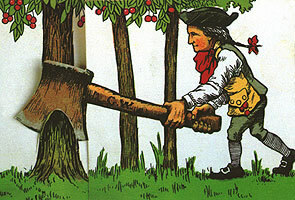 I realized today that in all my many years I have never heard anyone raise one important question about the cherry tree legend, namely why did little George chop down the tree in the first place? Yes, his honesty when confronted with his misdeed is wonderful, but what was the motivation in the first place? Was it done on a dare from a buddy, or a simple act of youthful rebellion or curiosity? Did he have a new axe that was just itching to be tried out? One possible explanation occurred to me today as I was gathering peaches that had fallen on the ground from our one overzealous peach tree. Let me back up and set the context for my ah hah moment. For about a week now we have been a bit overblessed with very good peaches from the one peach tree in our yard. We have frozen, dehydrated, eaten delicious peach crisp, gained weight, given some away—and yet we still have buckets full cooling in the basement and the tree is still loaded. After several long evenings of peach juice dripping through my fingers as we have peeled and sliced and diced them I am having nightmares about rouge peaches chasing me down the street. Yes, we’re grateful and they taste great, but I am left to wonder again, why do they all have to be ripe and ready at the same time? So here’s my theory: young George may have been in a similar situation where he had spent more time than he wanted picking and processing cherries. He wanted time to play with his friends or explore the plantation; so one day in a moment of exasperation he put hatchet to trunk, and as they say, the rest is history—or legend. And just as I was writing this I realized the flaw in my hypothesis. Washington’s family had slaves to pick and process their produce. So that chops down that idea, and it doesn’t help my peach problem. And I’m still left wondering why George chopped down that poor tree? Any ideas?